We are cozy, clean and quiet private studios and apartments with fully-equipped kitchen. 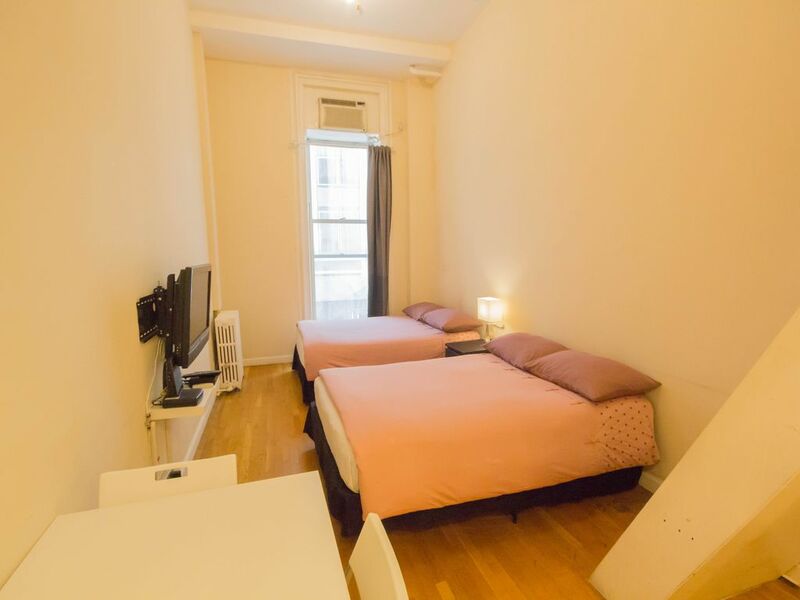 Our studios and apartments are located in the center of Manhattan near Empire State Building, Times Square(15 Minutes by Walk) with almost every major tourist destinations reachable via major public transportation including subways and buses, as well as car service and NYC taxi. You will be in the most prime location of New York City. NOTE - Although five people have no problems to sleep, The active space will be limited. Major subway line stations (34th ST - Herald Square [B,D,M,F,N,Q,R]) are only a 1-minutes walk away. Penn Station( A,E,C,1,2,3,LIRR ) is only 5-minutes walk away from our studios. Our location is within the vicinity of an unlimited variety of restaurants that range from fast food take-out to exquisite fine dining. There are also many health food markets for those who prefer to dine in. The Midtown nightlife also accommodates a wide range of interests through cafe lounges, bars and even authentic ethnic flavors! We sell tickets for sightseeing and Broadway musical tickets at whole sale price. No need to wait in line and spend at window price! Gain access to special attractions with Studio Plus! Everything you heard of New York City is just minutes away from our location! Times Square (12 mins walk) : The heart of Manhattan and its entertainment hub. Theatre district of Broadway is nearby and many cinemas, restaurants, shopping malls and parks. Empire State Building ( 3 mins walk ): Since 1931, the Empire State has received 120 million visitors. The 1,453-foot skyscraper is on Fifth Avenue and 34th Street in midtown. Rockefeller Center ( 2 stops by subway ): In the center of Midtown is a complex of stores, attractions, and restaurants. United Nations ( 10 mins cab ride ): A distinctive complex in NYC, United States, that has served as the official headquarters of the United Nations. Metropolitan Museum of Art (10 mins cab ride ): The most popular museum in NYC, holds a treasure trove of artifacts, paintings, sculptures, and more. Central Park ( 3 stops by subway ): The heart of Manhattan is the essential breathing space. Laze around; enjoy boating in the lake or public performances in the open air theater. Stayed there with three people for a week. Overall okay but would probably not go back. * Old building with shabby front, run-down public spaces, hallways, staircases, digustingly filthy and smelly. * Overall state of the apartment is far more run-down than pictured. Moldy silicone in bathroom, scruffy walls and doors, mildew spots. Would desperately need new paint and thorough cleaning. * Cleanliness is disputable to start with and there is no equipment to clean during the stay (broom, mop etc.). * Sheets and towels very worn and threadbare. * Stair case to upper bed is very steep. * Location in Midtown is great! * Apartment is furnished as pictured. Large enough for three. * Expensive, but apparently still good price for NYC. The cleanliness was not as pictured. We had 2 cockroaches in the bathroom in the four nights we stayed. We also saw a mouse that ran out by the bathroom to the closet and exited through the wall. We only know that it exited there because we saw it enter the hallway thru there. We either saw it on two separate occasions or 2 different ones, not sure which. The location was a good location. It was not far from Times Square or the Empire State Building. There were also good places to eat near by and a subway station to get us anywhere we needed to go. If I had to chose over again, I would not have stayed here. Perfect spot for a stay in midtown! Conveniently located too! I thoroughly enjoyed my stay. The hallways are a little old and you can tell the building has been there a while but once you get in the room it’s very nice. I was a little taken back by the age of the room because you can’t tell by the pictures but it still was very clean with a remodeled bathroom and kitchen. I definitely will be staying there on my next trip to NYC. This place was perfect. The location is walking distance from most famous locations such as Time Square, Bryant Park, Port Authority Bus Terminal and the subway. The staff was friendly, helpful and courteous. I will definitely use them again. We enjoyed our stay at the Loft Studio. We would definitely stay there again. It was in a great location, fit our family of five, and was very clean and affordable. The only suggestions I would make is to provide more basics like wash cloths, hand towels and dish soap. This was a great place to stay. Exactly as shown, very comfortable beds, nice sized bathroom. Hosts were friendly and helpful. The trash trucks were very loud at night, but being right in midtown close to everything was an even trade off.